study skills – managing your time efficiently – organising your schedule – note-taking – overcoming the loneliness of the distance learner – how this course works. 350 Hour Diploma in TESOL Course is scheduled to complete in two years, and an enrolment is valid for up to two years commencing from the date enrollment is completed. Spring 2018 Registration is now accepted. Teaching qualifications are becoming more and more important these days. While there are still opportunities for those who can rely on being a native speaker or having a degree in education, the better career opportunities now require more specialised experience and training. One of the reasons behind this is how much globalisation has influenced people’s working lives and career goals, making a shift from learning English as a hobby or interest to learning English as a need. As such, the English Language Teaching (ELT) industry has grown substantially, with more opportunities available nowadays. This can include education management, teacher training, curriculum development and assessment. It is common now for educational institutions to request a Diploma in TESOL for its academic managers rather than just having a Certificate in TESOL (which has become commonplace). With students learning English as a necessity, it has increased their expectations of their teachers and English programmes, so much so that Diploma level TESOL educators are utilised as senior teachers in schools, often being responsible for the professional development of the staff room. Courses and coursebooks are updated more frequently these days to keep up with demand, so the responsibility for this type of development often ends up with teachers with higher level qualifications. Experience by itself may not be enough to be eligible for all of these career opportunities. The INTESOL Japan Diploma in TESOL has been designed to cater for educators who are in need of more specialised knowledge in English language teaching, which can assist with career enhancement. Each module explores deeper concepts in semantics, phonology, psycholinguistics, discourse, syllabus design, the use of materials, methodology and teacher development to name a few. The programme makes good use of proven academic resources, with tasks that make our trainees more aware of some of the finer points of TESOL. There are two Skype Support sessions per week which students can use to consult a tutor if they wish. This can be to clarify some of the course content, check understanding of assessment tasks or to further discuss module feedback. Regular video lectures are provided on some aspects of the course content by a course tutor. These provide a helpful way to gain further clarification of the module notes, although attendance is not compulsory. 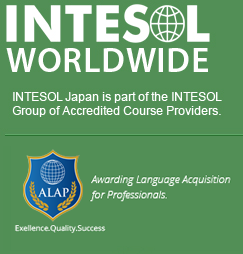 INTESOL Worldwide TESOL/TEFL courses are accredited and certified by ALAP (Awarding Language Acquisition for Professionals), a UK based Awarding Organisation. 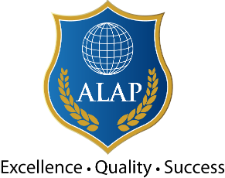 ALAP is an accrediting organisation that specialises in the ELT industry.ALAP is supported by an esteemed Academic Panel who are all experts in the field of English Language Teaching. The ALAP panel oversee matters related to academic quality, ensuring that the value of an ALAP Certificate is upheld. Your 350 Hour Diploma in TESOL Course is moderated and the procedures are checked by an external body.